SCRAPPING NOMAD: Giveaway winner and new Freehand Scraps reveal! I am so sorry for not having posted this sooner, but it has been a very busy weekend, and I have switched computers, which is driving me crazy! Every time I need to do something I realise I don't have the necessary program, or the one I have is completely different from the one I had before and it takes some time to adjust. Love my new computer, though, so I can't complain! I just went through my list of comments again making sure nobody was left out, then used random.org to choose the winner. And the winner is JILL!!!!! Jill, please send me your snail mail addy (click on the e-mail link in the sidebar) so I can mail the prize to you. Enjoy it!!!!! And now I'd like to show you some other projects I've made with this month's kit at Freehand Scraps. If you haven't seen it yet, click here to have a look at it. 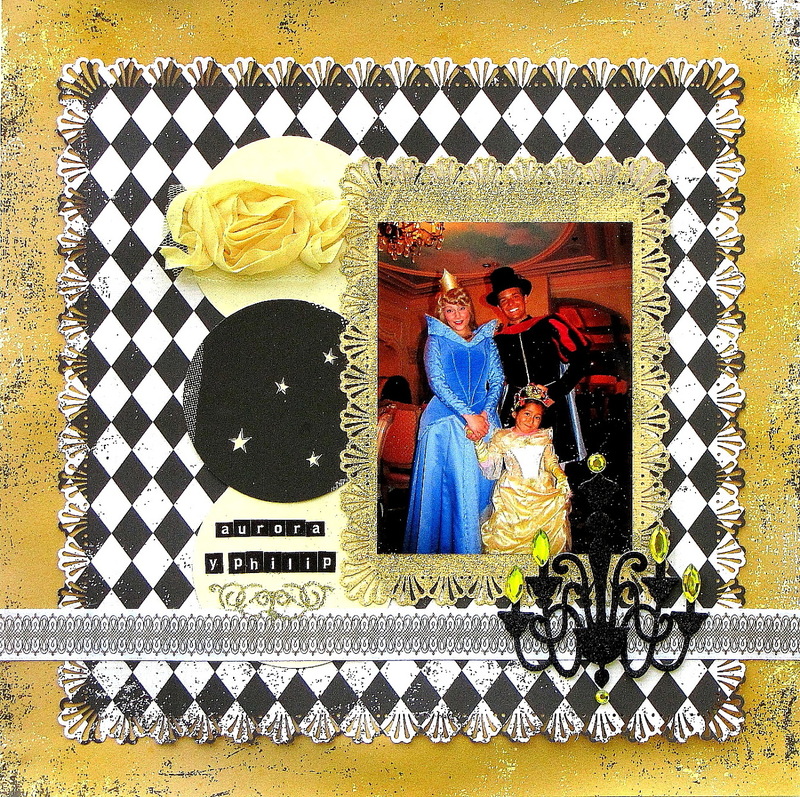 The first project is a layout based on a Pagemaps sketch, with one of the pics we took when we had lunch with the princes and princesses at Auberge de Cendrillon in Disneyland Paris. It was a magical lunch and my daughter was ecstatic! Here she is with Philip and Aurora (you may notice the photographer -DH- cut their feet off, but the magic is still there! 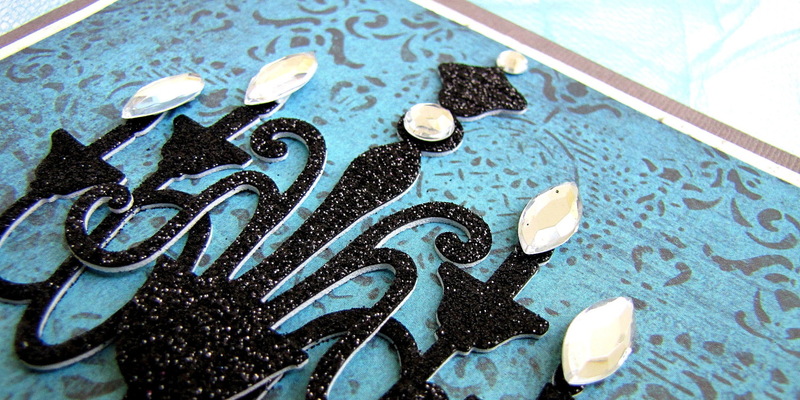 ), and the place was very elegant, so I thought these elegant papers and embellies would do the trick. I am very happy with the result. As I said in my previous post, lots of glitter this month! I used gold glitter on the frame of the picture as well as the swirls below the title. The chandelier was glittered already, and I used a yellow Copic marker to change the colour of the rhinestones. All the materials I have used came with my Freehand Scraps kit, except for the ribbon (Martha Stewart) and the flower trim (American Crafts). 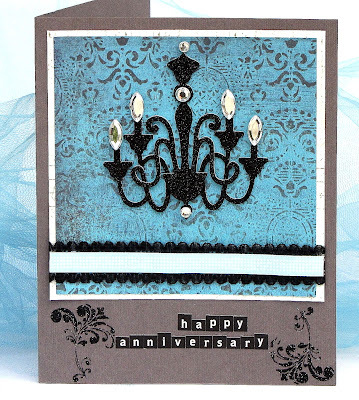 And I have another card to share, this one using the other chandelier that came in the kit, and the swirls again, this time with black glitter. I love how easy to use and neat looking the swirls are. And they look so elegant in black! I hope you have enjoyed having a look at these projects, I have more projects to share with you this week and a tutorial coming soon, so come and visit when you have some free time! Congrats Jill! Beautiful layout and card Caro! !